Ohio State coach watches as quarterback Danny Vanatsky (10) runs the offense during Saturday’s spring game at Ohio Stadium in Columbus. 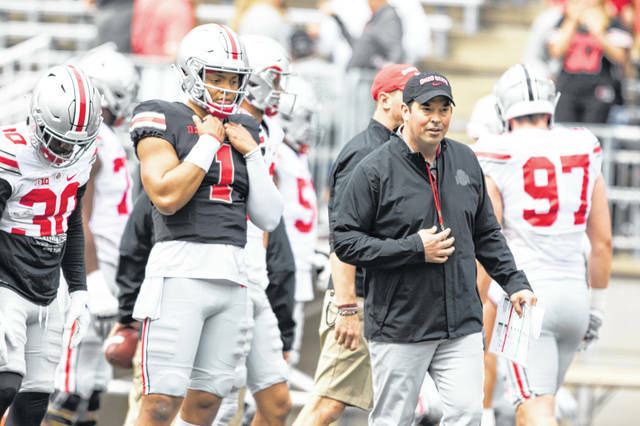 Quarterback Justin Fields (1) and coach Ryan Day watch during Saturday’s spring game at Ohio Stadium in Columbus. 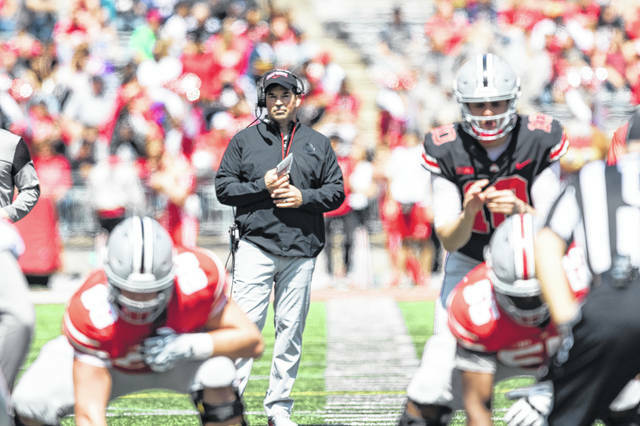 COLUMBUS — Ohio State football coach Ryan Day said after the Buckeyes’ spring game on Saturday it’s not time yet to decide who the Buckeyes’ starting quarterback will be this season. But that doesn’t mean there wasn’t a big decision made at the spring game. That decision came when punter Drue Chrisman proposed to his girlfriend Avery Eliason on the field at halftime and she said yes. “I couldn’t think of a better place to do it than Ohio Stadium, said Chrisman, who has been OSU’s punter since the beginning of the 2017 season. Chrisman and former Ohio State kicker Sean Nuernberger set up the proposal — which had to get though several levels of approval from the athletic department — by telling their girlfriends there was going to be a kicking competition between the kickers’ girlfriends. While Chrisman was ready to say she’s the one, Day wasn’t ready to say he’s the one about either of Ohio State’s top two quarterbacks, Justin Fields and Matthew Baldwin. The spring game was the first public audition for Fields, a hardship transfer from Georgia, and Baldwin, a redshirt freshman who spent last season rehabbing a high school knee injury. Fields said it was the first time he had thrown a pass in Ohio Stadium. Fields, who was ranked the No. 1 overall recruit in the country by 247sports.com coming out of high school in 2018, was 4 of 13 for 131 yards and one touchdown, a 98-yard connection with Binjimen Victor. He also rushed for 38 yards on eight carries. Baldwin was 20 of 36 for two touchdowns and threw two interceptions. He carried the ball four times for -6 yards. “I don’t really know right now. I’m going to keep looking at it. Everybody wants to know. Right now we’re not going to make a decision on that,” he said. Whoever wins the job will face big expectations after Dwayne Haskins threw for 4,831 yards and 50 touchdowns last season for OSU with Day as his position coach. Fields’ evaluation of his performance was that he can do much better than he showed on Saturday. “I feel like I’ve only scratched the surface. If I had to grade myself today I’d give me a C-. I’m very hard on myself,” he said. Baldwin was not available for interviews after the game. The Gray team won the spring game 35-17 over the Scarlet team. • Five-star wide receiver Garrett Wilson, an early enrollee in the 2019 recruiting class, delivered the “wow” factor in the second quarter when he went high over Sevyn Banks to grab an 18-yard touchdown pass from Baldwin. “Nobody on the team is surprised by that,” Fields said. Wilson finished with 4 catches for 44 yards. • Leipsic High School graduate Gavin Cupp started at left guard for the Scarlet team. • Safety Jahsen Wint had two interceptions. • Sophomore running back Master Teague was the game’s leading rusher with 75 yards on 7 carries. Marcus Crowley, another early enrollee in the 2019 recruiting class, rushed for 50 yards on 10 carries and scored two touchdowns.